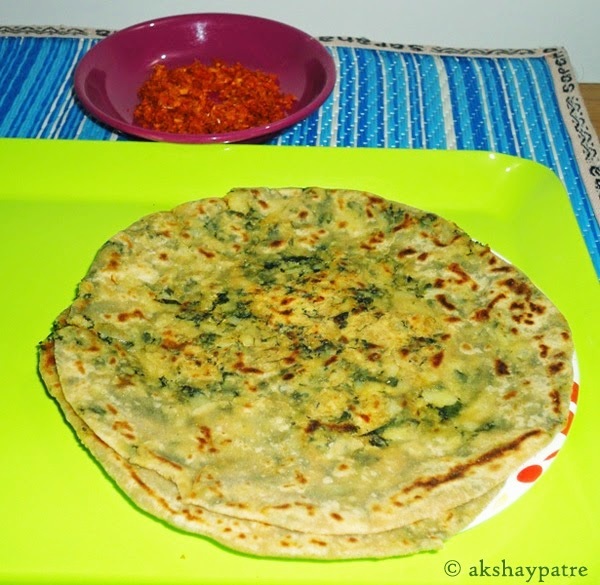 Aloo methi stuffed paratha recipe - One of my common practice is to make stuffed parathas or mix and roll theplas at least 2 to 3 times a week, so that kids have vegetables with roti simultaneously. 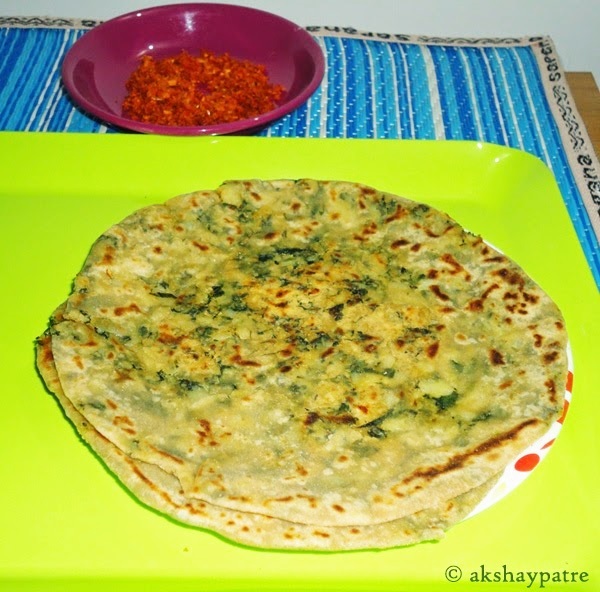 I have already posted few parathas and theplas recipes earlier. But aloo methi paratha is my all time favorite. It has mild fenugreek leaves flavor and soft texture on account of finely mashed potatoes. One can eat ghee applied hot parathas along with some yogurt and pickle. You don't need any side dish to go with it. Some chutney powder mix with yogurt also works wonder with this paratha. This is awesomely delicious and filling, something different than regular chapati and subzi. You can also pack it in a lunch box. Aloo methi paratha is a wholesome and healthy meal that you can serve your loved ones with pride. Simple side dishes like chutney, pickle and curd goes well with it. Combine together the maida, wheat flour and sieve them. Add salt to it. Knead them to a soft dough adding water and little bit of oil. Keep it aside for 15 minutes. Wash the potatoes, peel and cut them into large pieces. Steam the potatoes in a steamer till they become soft, allow them to cool, mash and keep aside. Wash the methi leaves, drain and chop them finely. Heat 1 tbsp of oil in a pan, add the chopped methi leaves, saute for a while and cook covered till the leaves turn soft. Mix well to make the stuffing. Take a large lemon sized dough, roll out a small poori sized roti. Take 2 tbsp of potato, methi stuffing and place it on the roti. 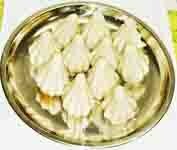 Lift the edges and join them in the top giving modak shape to it, then twist the tip as shown in the picture below. Now flatten it and dust with wheat flour. Then gently roll out into thin paratha. Heat a griddle and rub 1/4 tsp of ghee on it. Shallow fry the paratha till golden brown from both sides. Remove and apply 1/4 tsp of ghee on the hot paratha. Serve hot with your favorite side dish. 1. Wash the potatoes, peel and cut them into large pieces. Steam the potatoes in a steamer till they become soft, allow them to cool, mash and keep aside. 2. 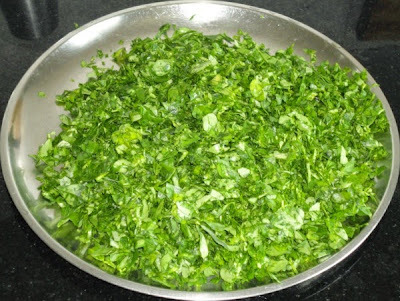 Wash the methi leaves, drain and chop them finely. 3. Heat 1 tbsp of oil in a pan, add the chopped methi leaves, saute for a while and cook covered till the leaves turn soft. 4. Once the leaves turn soft, add the coriander seeds powder, cumin seeds powder, chilli powder, turmeric powder, salt and mix well. Saute for a while and add the steamed, mashed potatoes. 5. Mix well to make the stuffing. Take a large lemon sized dough, roll out a small poori sized roti. Take 2 tbsp of potato, methi stuffing and place it on the roti. 6. Lift the edges and join them in the top giving modak shape to it, then twist the tip as shown in the picture below. 7. Now flatten it and dust with wheat flour. Then gently roll out into thin paratha. 8. Heat a griddle and rub 1/4 tsp of ghee on it. Shallow fry the paratha till golden brown from both sides. Remove and apply 1/4 tsp of ghee on the hot paratha. Serve hot with your favorite side dish. Thank you so much Linsy.